Let this just be said: Mary Poppins forever. P.L. Travers’ magical nanny is one of the strangest and most memorable figures in children’s lit, an unsentimental drill sergeant of a woman who introduces her charges to a world of magic, freedom and imagination. The Disney movie is a classic in its own right. But even as a kid, I could see that Walt, Julie Andrews and co. had rubbed off the sharp edges, making Mary Poppins conventionally sympathetic where Travers’ version borders on scary. 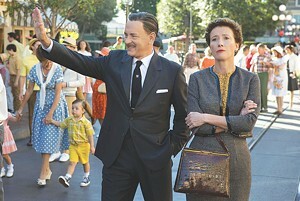 Saving Mr. Banks is a movie about that adaptation process — which, in real life, was notoriously acrimonious. Ostensibly told from Travers’ point of view, the film is actually an extended apologia for its maker, Disney. The deck is stacked, and the disingenuousness is profound, but director John Lee Hancock (The Blind Side) is good at saving his big schmaltz cards to play at the end. In the meantime, like Disney’s Mary Poppins, Mr. Banks offers a fair bit of fun. Much of that enjoyment comes from Emma Thompson’s comic turn as the author. Prim, proper and relentlessly high brow, her diction as clipped as a royal lawn, Thompson’s Travers doesn’t hide her disdain for Walt Disney (Tom Hanks) and his populist sentimentality. “She’ll be twinkling and cavorting,” she tells her literary agent in horror, accurately predicting the Mouse’s version of her famous character. But the movie has that schmaltz ace up its sleeve. The Hollywood scenes alternate with flashbacks to Travers’ childhood in Australia, in which we learn that this gorgon was once an adorable little girl (Annie Rose Buckley) with a blind love for her charmingly irresponsible daddy (Colin Farrell). These gold-tinged sequences, liberally ladled with elegiac strains from Thomas Newman, serve an agenda: to get at Travers’ real motives for being so controlling. Once we — and Disney — know her deepest emotional truth, the script suggests, creative conflicts will evaporate. Travers’ Mary Poppins will become Disney’s. Except that’s not how life works. (Or worked in this case: While Travers did end up signing away the rights to her books, she wasn’t happy with the result.) Saving Mr. Banks commits the fallacy of interpreting everything an artist produces as a veiled confession. Still, when Disney sits down to bare his own innermost soul to Travers, hoping for reciprocation and a truce, Hanks’ understated performance makes it hard not to be a little won over by the naïveté this impresario embodies. There’s also a subtle canniness in the portrayal: We sense that Walt (as he insists his employees call him) is consciously using his artlessness to worm his way into Travers’ (and our) good graces. Does it work? Even Disney skeptics may occasionally warm to the company’s gentle ribbing of itself, and to the colorful characters who represent its flunkies, including Paul Giamatti as Travers’ chauffeur; and Bradley Whitford, Jason Schwartzman and B.J. Novak as the hapless writers baffled by her demands. 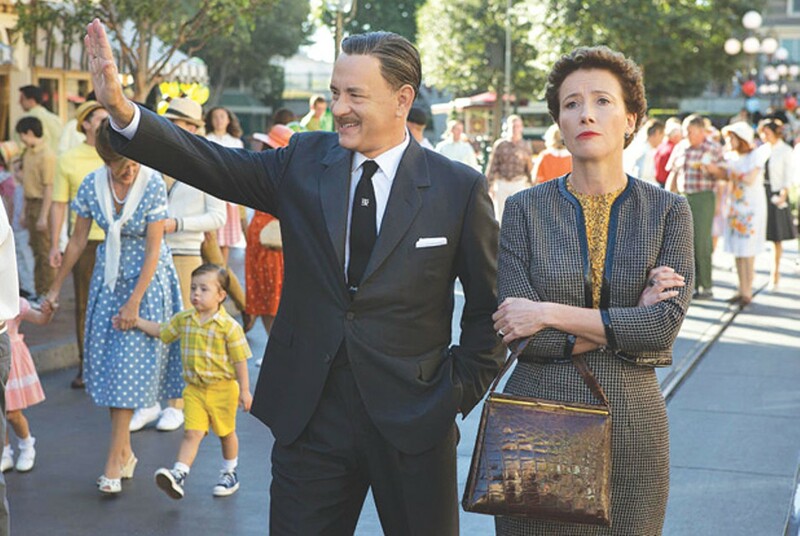 As a Travers biopic, Saving Mr. Banks fails because it reduces the author to the little girl in those flashbacks, ignoring most of the life that formed her prickly temperament. As an act of special pleading for Disney, it’s more effective. Still, one can’t help noting what the film’s Travers says as she begs for her version of Mary Poppins: “She doesn’t sugarcoat the darkness.” This movie does. * Running time: 125 min.